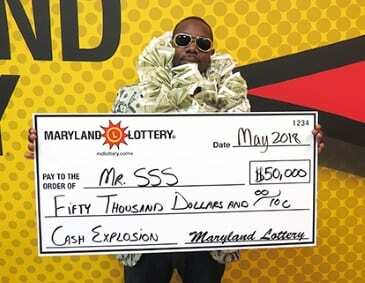 Finding himself $10 short while at a convenience store to purchase a $30 scratch-off, a Parkville man “settled,” instead, for the $20 Cash Explosion instant ticket. It was a close call, the lucky $50,000 winner told Maryland Lottery officials. The 37-year-old state employee is a big fan of Maryland Lottery instant tickets, playing them several times a week. He’s had luck in the past and recently won $20,000 in a My Lottery Rewards second-chance contest. The Baltimore County resident was on his way to visit friends when he stopped at Lottery retailer E-Z Convenience at 8104 Loch Raven Boulevard in Towson. Visions of a $30 scratch-off filled his mind but he left with the lucky Cash Explosion instant ticket. “I started scratching the play area and saw a $1,000 win almost immediately. I was thrilled!” The more he scratched, the more automatic win symbols he found. “One of them was for $5,000! Then, one for $10,000!” All told, his Cash Explosion symbols and matches added up to $50,000. “Mr. SSS” will put his Cash Explosion windfall into savings, paying bills and a vacation next year. His lucky $20 game debuted last August boasting seven $1 million top prizes. Five remain unclaimed. Nine of its 13 $50,000 second-tier prizes are also still available.